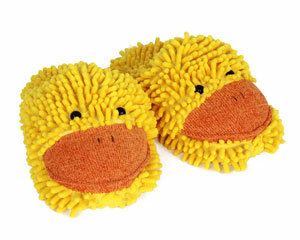 Make a splash with these webbed duck feet! 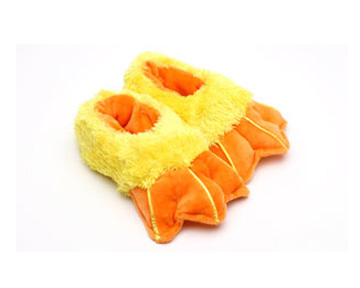 Super soft yellow plush and three orange toes create an adorable and cozy full-footed slipper. Made with a sturdy foam footbed and slip-free soles. Whether you’re feathering your nest, or paddling around the pond, these will be a big hit! Quack quack! Product was exactly as described. Shipped quickly. Just what was expected. Prompt shipment & delivery too. Advantages: Convenient to order, timely arrival. Disadvantages: Although the product was exactly as expected, the product line could benefit from the use of a slightly heavier, more durable sole material even if it meant a little higher price. I like these slippers a lot. Advantages: Very warm. Feet are not cramped. Toes have room to lie naturally. Disadvantages: Wish I had ordered two pair. My "Duck Feet" slippers were the BEST! Along with my ducky pajamas, I was a big hit at my elementary school "PJ Day!" Disadvantages: I ordered the medium, and it was a big snug on my size 9 feet. Super nice people. Needed it quick and got here as needed. Thank you guys! My granddaughter is excited about her duck slippers that go with her costume that we put together for Halloween! She will be a white duck like the famous one from TV commercials.